Alphabet Inc. (NASDAQ:GOOGL) just announced its first quarter earnings for 2018. The company reports Revenues of $31.1 Billion which are up YoY from $24.8 Billion in the first quarter of 2017. The earnings call comes amidst recent developments around Facebook and scrutiny around its data sharing, both voluntary and involuntary. However, while Facebook is under the limelight these days, Google collects almost the same amount, if not more information from users. Therefore, heading into the earnings call, investors feared a similar scrutiny for Alphabet (NASDAQ:GOOG). Prior to today’s earnings release, Thomson Reuters forecasted analyst estimates for Alphabet’s Revenues and Earnings Per Share stood at $30.1 Billion and $9.28 respectively. 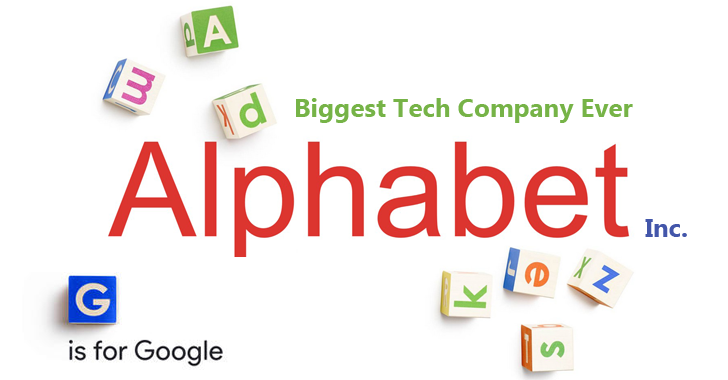 Alphabet (NASDAQ:GOOG) beat both of these with a $31.1 Billion in Revenue and $9.93 EPS. Net Income for the company stands at $9.4 Billion, which marks a 74% growth YoY. While Year on Year revenues grew for Google, Quarter on Quarter fell by $1.2 Billion. 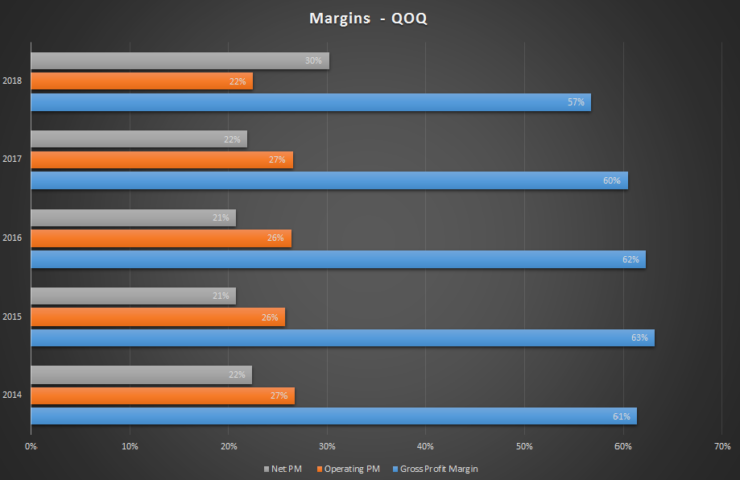 QoQ Net Income jumped from the negative into the positive. Last year Alphabet (NASDAQ:GOOGL)’s final profit number went down in the negative due to a one-time tax charge resulting from the government’s Tax Cuts and Jobs Act, 2017. Traffic Acquisition Cost, which is the amount Google pays to its partners to ensure that its search engine is the default option, grew YoY from $4.6 Billion in Q1 2017 to $6.3 Billion this quarter. However, they fell QoQ, by $1.62 Billion. YoY increases in TAC reflect Google’s growing focus towards mobile searches which continue to outpace their PC counterparts. TAC as a percentage of Advertising Revenue stood at 24%. Advertising Revenues for Q1 2018 are $26.6 Billion, up from $21.1 Billion YoY. It’s a positive development which reflects that Google’s increased TACs are paying off in term of greater searches and Youtube engagement. 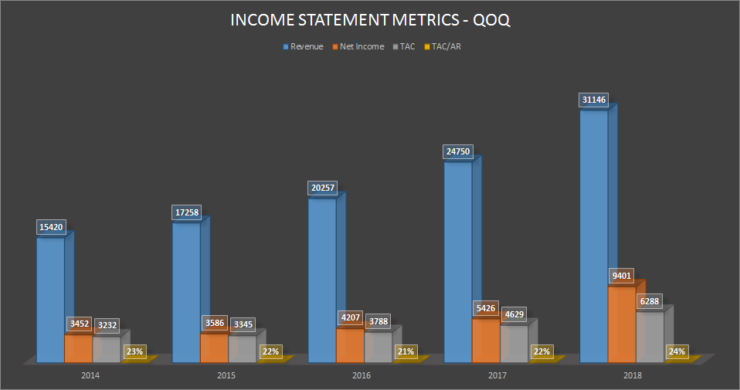 Net Income for Q1 was affected by the ASU 2016-01, which requires all gains and losses for equities securities to be recognized under the Other Income and Expenses segment in the Income Statement. OI&E, therefore, jumped to $3.5 Billion. This number now reflects a net gain on equities securities of $3.03 Billion. Without the new framework, Alphabet’s Net Income would have stood at $12.4 Billion. This gain in equity securities reflects Alphabet’s recent investment in ride-hailing company Uber. The boost to both Revenue and Net Income is party due to Nest’s incorporation into Alphabet Inc. (NASDAQ:GOOG)’s Income Statement. The manufacturer of all Internet of Things accessories and gadgets now has its Revenues reflected in Alphabet’s Income Statement. The quarter also marks a change in monetization metrics for Google from the percentage change in the number of paid clicks to the percentage change in the number of impressions. Paid clicks for YouTube and Google Search increased by 8% YoY while Cost per Click decreased by 7%. Gross and Operating Profit Margins for the company fell YoY, to 57% and 22% respectively. Both represent troubling signs but Alphabet promises us that recent capital expenditures and a focus on mobile searches are to blame for the decrease.